Got plenty compliments. Love it for the look, and the price. This beautiful watch from Akribos XXIV is sure to attract attention. Featuring genuine diamond hour markers on a beautiful sunray dial is one of the ways this watch stands out. A beautiful linked bracelet brings this stylish look together. 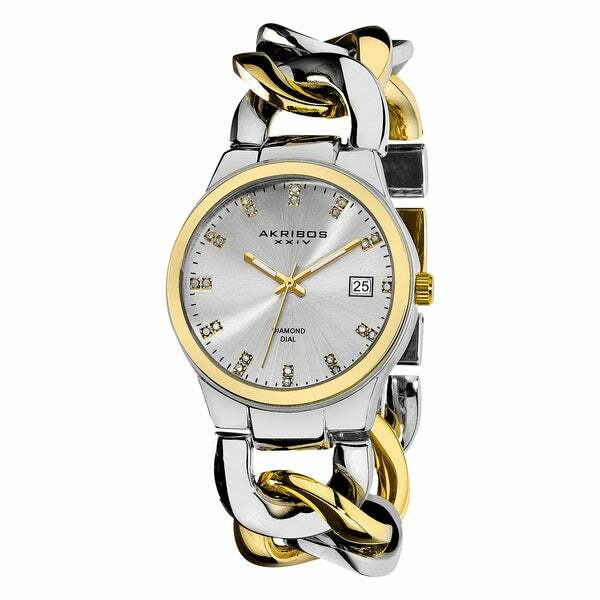 Beautiful watch that you can size yourself with removable links at the clasp. This is best purchase I've made in a very long time. This watch is so pretty and looks like a very expensive name brand one. The best deal I've ever had, with a great price to boot! I've had so many compliments on it every time I wear it and do so everyday. Buy it you will love it too! The looks, style, quality and durability of this watch is excellent. I would highly recommend this watch to my family and friends. I love it! Be aware of its' beauty and style! I truly like this watch for its' style and quality. Go for it! You will like the way it looks on your wrist for casual style. I wouldn't wear it with formal dress. I like a loose fitting watch that wears like a bracelet, exactly like this one. The band allows for the removal of one link which I had to do. At first it was so loose that it almost slid off my wrist and removing the one link was all that was necessary to correct that. The product information is accurate. As I said before: Go for it! Love the "presence" of this watch. It has enough weight to appear heavy but is quite comfortable. Looks expensive. Great price for this watch. Love the bi-color of white and yellow gold as I mix my colors in my jewelry. You can read the time without your glasses "if you're over forty!" Keeps accurate time. I love mine. Would recommend to others. 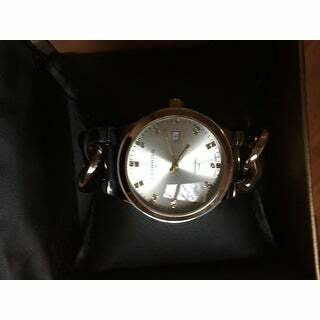 Free gift when ordering my Akribos XXIV watch. I just received my watch. I love it. However, the minute hand on the FREE watch will not stay on the correct minute. When I turn it the hand moves forward freely 3 minutes. As I move it back the hand also moves. I will be unable to wear it. This was a beautiful watch,although it was a bracelet, the face and the band on the watch was too big for me. I love the look of this watch and based on other reviews decided to purchase it in the silver/gold tone. It comes attractively packaged but when I opened it I was surprised at the size. It is obscenely large and almost looks more like a man's size. It's too bad because I really love the stylishness and overall look. Unfortunately, I returned it because size matters. I bought this watch and it is simply beautiful. It is a little larger than I expected, but I love the watch. I was thrilled with the price I paid for this watch. I do receive lots of compliments on the watch. I will definitely recommend this watch to others. I had no idea this watch and watch band were so large. To make it smaller would require a trip to the jewelers. Luckily it fit my daughter, so she wears it. But I wanted it to fit me. Just received my watch. So far I'm very pleased. Chunky heavy watch. Nice fashion to it. Within 2-3 weeks, there was condensation under the glass, although dried up by itself with in a few days, the top of the glass fell off a couple of weeks later. Did not even bother to repair it. Absolutely beautiful. Just an expensive looking watch at a reasonable price. You can definitely wear this with pride. Looks good for special occasions or to work. Great funky watch! I love it! Big bold and fun! Received this watch quickly. It is as beautiful as described. I wear it frequently and get many wonderful commments. This time piece is beautiful. It can be worn with business attire or casual. It is definitely an eye catcher. I have had to purchase one of these for my daughter since my wife, sister and mother have all enjoyed their's so very much. It's stylish but not too dainty and rugged enough for regular wear. To big for me sent it back. I ordered one several months ago and really liked the watch. Unfortunately the band broke and I did not keep the packaging or the receipt. I am ordering a new one that I hope does not break.